The health sector’s organization to manage risk is based on technical as well as political/administrative criteria. The latter are covered in an earlier section. This section describes the technical elements that govern the functions, responsibilities, and organization of health disaster programs. 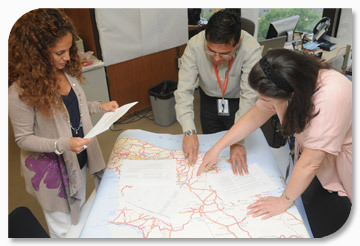 Analyzing the hazards, vulnerabilities, and level of emergency and disaster risk that jeopardize the health of the population, in addition to being a responsibility of the sector’s institutions, requires participation by other institutions that are part of the national risk management system, as well as by people from disciplines in other sectors, such as civil engineers, seismologists, environmental experts, sociologists, urban planners, and others. The responsibility for identifying, characterizing, and analyzing the impact of hazards and vulnerabilities on the health sector in disaster situations rests with all the health sector’s units and institutions, according as their respective areas of competence. However, a mechanism must be created to compile this information, and include information on the possible impact on health infrastructure and the available resources. Both quantitative and qualitative elements of hazards, vulnerability, and risks form part of an analysis, and therefore professionals from a variety of disciplines should be involved. However, communities themselves also play an important role. The IFRC has published vulnerability and capacity assessment guidelines (VCA) to enable their National Societies to help communities understand the hazards that affect them and take appropriate measures to minimize their potential impact. These measures are based on communities own skills, knowledge and initiatives – thereby preventing these hazards turning into disasters. An analysis of local hazards is generally based on a careful compilation of historical records of past events. If available, quantitative data is also used to assess the probability of the occurrence of a destructive phenomenon. Other tools used include aerial photographs, geological studies, and on-site observation. Drawing on analysis of the information compiled, simple or complex threat maps can be created to classify areas as being subject to high, medium or low levels of danger. An example of this approach is the wind maps of the Caribbean. Identifying high-risk areas is especially important when locating health care facilities. 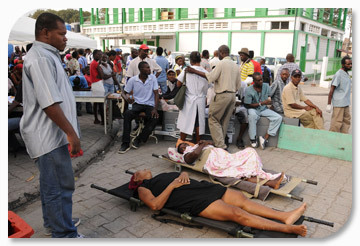 Concurrently with the implementation of risk reduction measures, the health sector should identify and analyze the potential impact of adverse events in terms of the magnitude of the event (size of affected population and geographical area); with consideration of the intensity or severity of impact during a given time period; and with a view to possible ways of meeting the resulting health needs. The accuracy with which the potential impact of an adverse event can be determined is a function of the quality of existing knowledge about the hazard, and the extent to which the interaction of the hazard and the vulnerability of the population is known. An accurate determination makes it possible to know in advance what threats and needs are likely to materialize, and thus to more effectively establish the roles and responsibilities of the health sector personnel assigned to disaster programs.